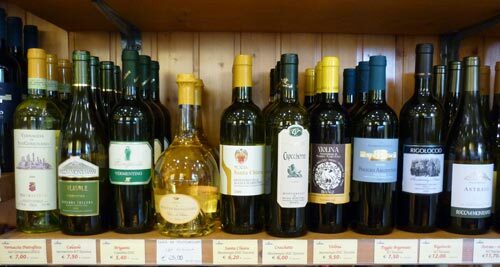 Looking for white Italian wine? Maremma in Tuscany and Lazio is home to internationally renowned wineries and many new vineyards that are producing not only the best Italian wines, but also some of the most innovative and exciting wines in the world. They aren't called Super Tuscan wines for nothing! Here you will find Maremma's white Italian wine list with links to information about each of the wine estates that produce them. Have fun browsing! I've included a link to some of the bestselling wine guides at the bottom of the page to help you get started in choosing some fabulous Italian white wines to purchase at home. Or, indeed, better still! to help you plan an unforgetable wine tasting tour in Italy. In alphabetical order by location of each Maremma winery and vineyard. Take the mystery out of choosing fabulous budget, middle of the price range and investment Italian red wines with a best selling Italian wine guide. For an instant de-coding of every Italian wine label: the Maremma Wine Guide Italian wine definitions - every term or adjective that you are likely to come across whilst reading Italian wine labels or on a wine tasting tour - all on one page.